5/5 stars with 844 reviews — Allrecipes Favorite. I really liked this recipe but next time I make it I’m going to omit the corn–or at least cut back on the amount of corn kernels I use. I would also double the sauce next time. 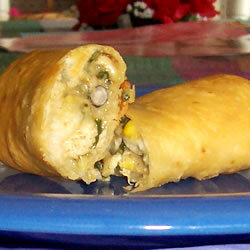 It was so good and really made these egg rolls delicious. For the sauce, mix: 1/4 cup smashed, fresh avocado (about half of an avocado), 1/4 cup mayonnaise, 1/4 cup sour cream, 1 tbs buttermilk, 1 1/2 tsp white vinegar, 1/8 tsp salt, 1/8 tsp dried parsley, 1/8 tsp onion powder, dash dried dill weed, dash garlic powder, dash pepper. Let the flavors set up overnight prior to serving as it makes the sauce so much better. Enjoy! The sauce really made these egg rolls delicious.